As I’m sure you saw, BMW officially released today the all new 2011 F10 5-Series and with it came 7,451 words of press release information. WOW! Whoever wrote it has my sympathies. While the press release was incredibly long with great information about the new 5, let’s take a moment to really talk about the highlights of the new car. It’s not the E60 anymore, so it’s going to be different for many to get used to. Sure, some might say it looks like the 3-Series, 7-Series and Z4 had a love child, but it’s something that those two aren’t; BMW’s most important new model for the next few years. It’s even more important than the F01/02 7-Series and it is about as important as the E90 3-Series. While the 3 sells more cars, the 7 is the luxury giant, the 5 is the car that most people making $60,000-$100,000 are going to be looking at. It’s BMW’s technology bread and butter. If it’s good enough for the 5ers, it’s good enough for the rest of BMWs. 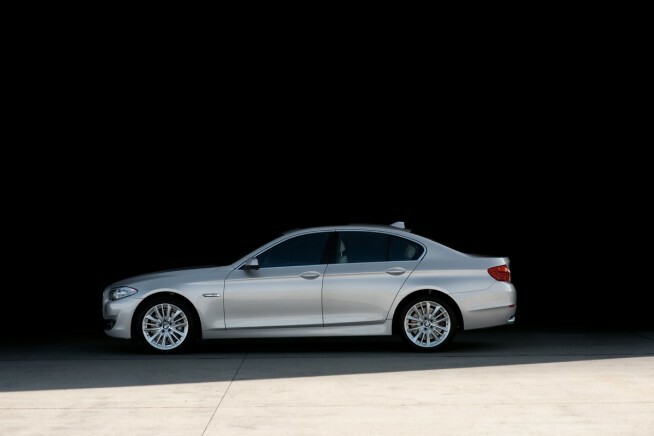 As you can see, and as I said before, the new F10 5 carries a lot of unique design aspects of the current 2010 3 and 7-Series cars. 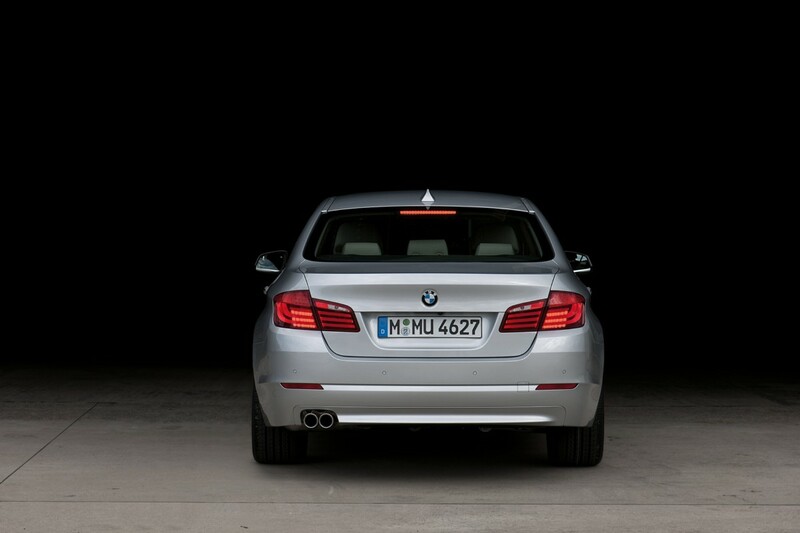 The headlights and front end share a lot with the 5 GT and the 335i. The headlights are slightly modified over the 3-Series units and much smaller than the 5-Series GT, making the new F10 its own uniquely styled BMW. The headlights actually take me back to the E46 3-Series Coupe of 2006, which just so happen to be some of my favorite styles of headlamps put on a car. Also, the hood is a design feature shared with the current 6 and 3-Series. And I’m very pleased to say this, it looks incredibly sporty and aggressive. The E60 5-Series could look a little too regular from day to day, which is why it makes me thrilled to say that this car really punches up the styling department. You’ve got to agree, Adrian Von Hooydonk and his team have done one fantastic job with the face alone. This now takes us along the side of the new 5. It’s interesting, to say the least. I know it will grow on me, but one thing that I have to point out is that from the side, it looks as though BMW has gone back to the shark design days… Does anyone else see the shark style front end? Going retro without looking it. But, the side, at least in the silver car pictures, looks a little too understated. Almost like a shortened 750i. It’s most likely just the color that’s making it look off. Still, we should point out that most critics will likely rave about the simplicity of the side view. It doesn’t have a lot of lines and carries one main, fluid one at the top going most of the way down the side. The Tail-end of it is where some new business happens. The old E60 had twin exhaust pipes coming out from left side of the car, and while this F10 carries that over, it also looks to the E90 with actual dual tailpipes on the 535i and 550i. BMW has typically taken a less aggressive look in the rear-end department to appease more of the subtle luxury crowd, but now they really give you something to stare at when you’re trailing behind the new car, for whatever reason that may be… Notice how the taillights look like the 3 and 7 cars, but with a more sculpted lens. Also, look out how well the rear tires fill out the back end. It really makes it look wide in the hips, which I think looks great. I must say, I wasn’t expecting such a wide interior. It looks much more roomy and appealing over the E60. It even looks more jump-right-in-and-go-for-a-spin inviting. Much more so than the E90. It has design status of the F01 7, but with the sporty nature that I’ve not seen in a 5-Series since the E39. Where the E60 may have lost some people with its more bland and plasticy nature, this new 5-Series looks to be much more upscale, especially with the wood. I like the look of the sportier standard steering wheel that is on this diesel model shown above. BMW now offers a standard 8-speed automatic along with the 6-speed manual. Or, if you’re in love with the idea of a manual without a clutch, you can opt for the 8-speed “sport” automatic with paddles. 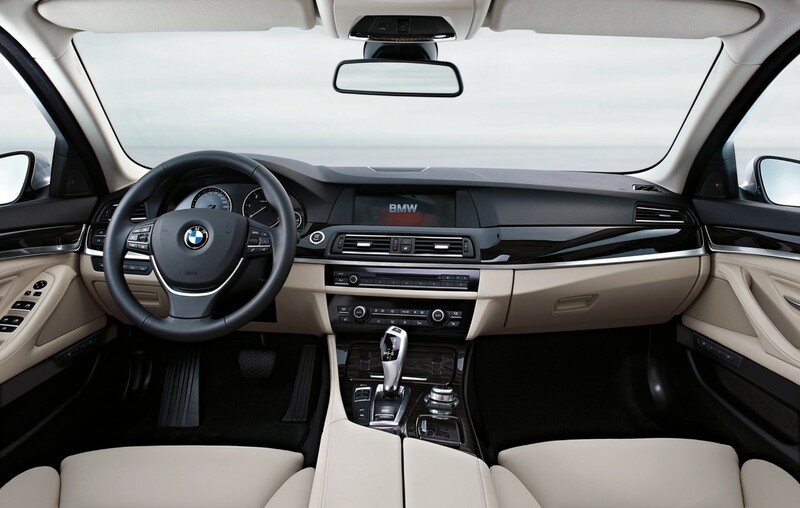 As for iDrive, you can see the knob more off to the right of the driver, it’s the same updated knob and buttons that you see on the current 2010 BMWs. You can also get just the standard iDrive with a standard 7-inch 800×480 resolution screen, or the actual navigation system with a 10.2-inch 1280×480 resolution screen. The front seats seem very sporty, but with support enough for comfort, too. But, the back seats truly deserve the attention here; BMW says to have increased rear knee room by .5 inches. Now that may not seem like a lot, but get in the back seat of a car with the seat touching your knees, and then have someone move it up a half an inch, and then see how much you enjoy it. All-in-all, you should see about 3-4 inches of rear knee comfort. As you can also see, the new 5-Series has a rear seat entertainment system just as the current 7-Series. But this one seems to be operated with a control instead of a dial as you see on the 7s. Also, the rear climate control can be independently operated by the rear passengers. Technology. World debut: BMW Parking Assistant and Surround View. As with every new BMW comes new and improved technology. 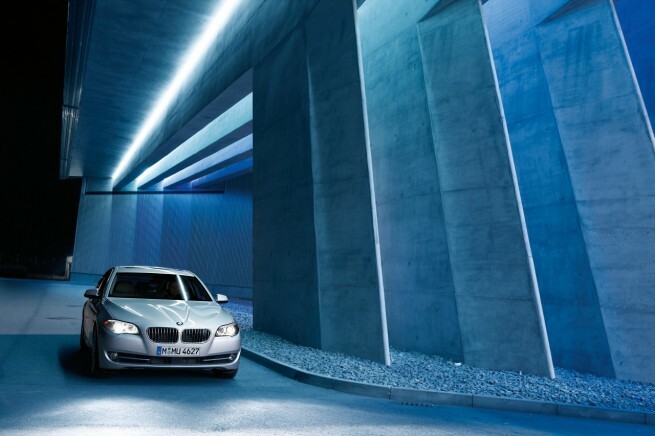 While the 5-Series was the first car in the world to debut with the self-reverse parking, or as they like to call it, “Parking Assistant”, it does just what it seems to do; it helps you back into parking spaces. All you have to do is operate the gas and brake and it steers itself into the appropriate space that you have mapped out using the iDrive system. It’s really much more simple than it seems. And as I said before, this all can be viewed through a standard 7-inch 800×480 resolution screen, or the optional navigation system with its 10.2-inch 1280×480 resolution screen. 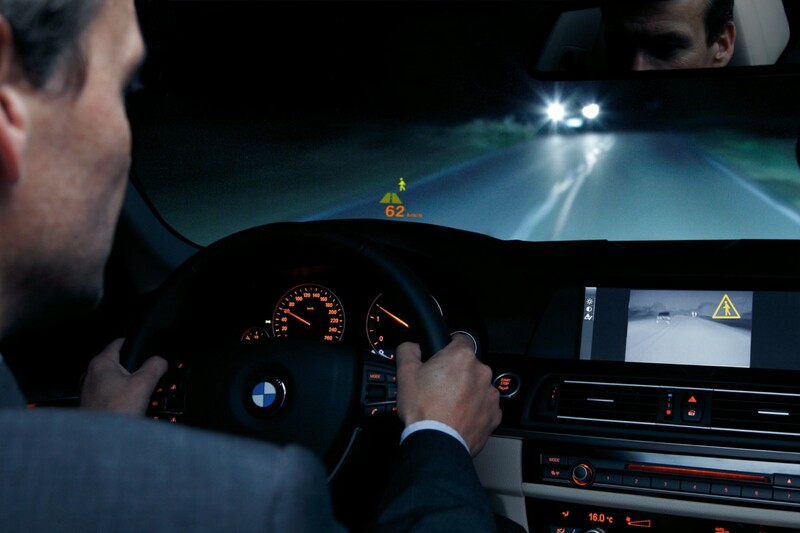 HUD, or Head-Up Display, is BMW’s way of giving the driver all the information they need right in front of their eyes. No need to look away from the road, it’s already posted on your windscreen for you. It will show you your speed, navigation information, the distance of the cars in front of you. It’s all built into it, pretty much. It will even point out people in the road with the optional night vision system, which uses thermal imaging to detect heat signatures that you may not be able to see with your headlights. It’s the same one used on the current 750 and 760, but it’s now just being offered on the 5-Series. Basically, whenever a person is in the road, on the side of the road, or crossing the road at night, the night vision system will pick this up and display a caution sign in the HUD. Along with BMW carrying over the above technologies, they’ve also brought with them their Active Cruise Control. That’s basically a system that allows you to use your cruise control, but allows the car to speed up and slow down for you whenever cars go and slower or speed up again. It will also help you come to a complete stop, if necessary, with the Stop and Go technology that comes on the ACC. 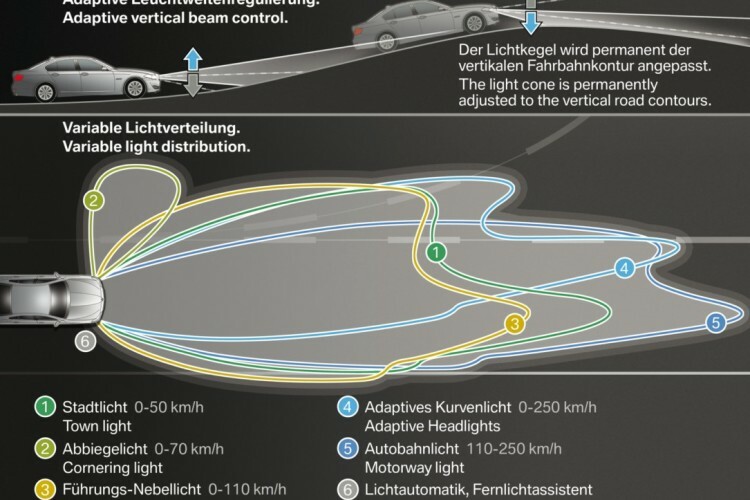 The new headlights come with the new Adaptive Xenon Headlights, which will not only turn around corners with you, but also raise up and down automatically depending on whether you are going up or down a hill. The headlights will always stay dead on track with where your steering wheel is pointing. 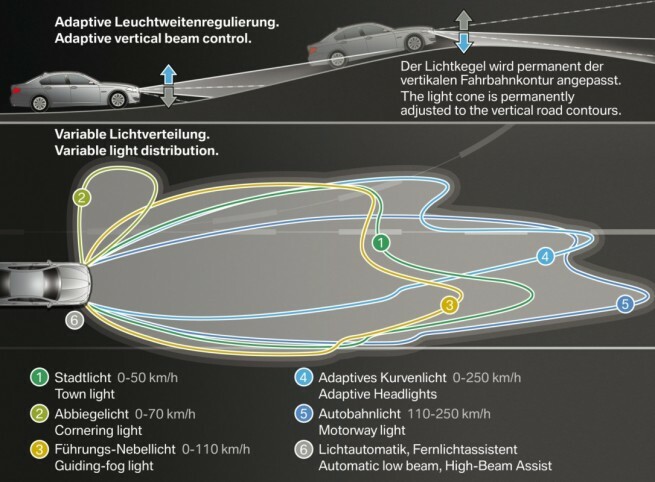 Also, BMW brings back its excellent Automatic High-Beam system, which automatically throws your high beams on whenever the level of light outside is below a certain point, and then will automatically turn off once the light reaches a certain level high, this includes oncoming cars. BMW has also added a Lane-Departure Warning system, along with an Active Blind Spot Detection feature. Both vibrate your steering wheel in a calm manner to let you know of the possible danger. Each will also show an LED indicator on the instrument cluster for another warning, just in case the vibrating steering wheel is a natural feeling that doesn’t get your attention. However, if you turn on your turn signals, the Lane-Departure system will not warn you of anything. “Top View provides an even more comprehensive and complete picture of the car and its surroundings. In addition to the back-up camera and the PDC sensors, Top View uses two cameras in the side mirrors, and combines all three images through a central processor. This provides an overall picture presented in the Control Display showing both the car and its surroundings from a bird’s eye perspective. This clear overview enables the driver to manoeuvre precisely even in confined spaces. This is just most of the technology and highlights of the new 5-Series, but stay tuned to BMW Blog for more details on all of the new features to come with the new F10 BMW. Goodbye to the E60, an old friend. But hello to the wonderful new friend to replace her. Previous post We’re at the 5 Series launch: What do you want to know?